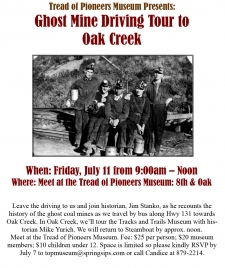 Leave the driving to us and join historian, Jim Stanko, as he recounts the history of the ghost coal mines as we travel by bus along Hwy 131 towards Oak Creek. In Oak Creek, we’ll tour the Tracks and Trails Museum with historian Mike Yurich. We will return to Steamboat by approx. noon. 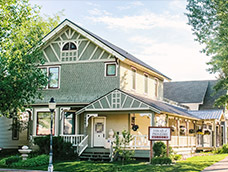 Meet at the Tread of Pioneers Museum. Fee: $25 per person; $20 museum members; $10 children under 12. Space is limited so please kindly RSVP by July 7 to cbannister@treadofpioneers.org or call Candice at 879-2214.